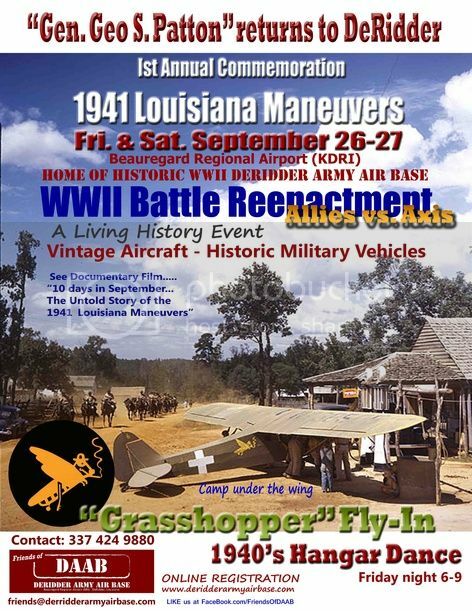 Friends of the Deridder Army Air Base (DAAB) to host the 1st Annual Commemoration of the 1941 Louisiana Maneuvers & “Grasshopper Fly-in” at Beauregard Regional Airport DeRidder, LA September 26 and 27th. This Living History Event will take you back to the 1941 Louisiana Maneuvers, forward thru WWII and into present day military training in Louisiana. Learn about the impact the Maneuvers had on Louisiana, the country and the world. Friday am the event kicks off with the departure of a convoy of vintage military & civilian vehicles from historic WWII DeRidder Army Air Base to Fort Polk. saturday Join us throughout the day as we share Louisiana Maneuvers & WWII memories. Prior to the event, the documentary video, “10 Days in September….the Untold Story of the 1941 Louisiana Maneuvers” will be shown to Beauregard Parish 7th & 8th graders in their classrooms.